The smallest man in pads—the field goal kicker—trots out to the 30-yard line. Though only seconds remain in the game, his uniform is spotless. Setting up next to the squatting holder, he takes four measured steps backward followed by three equal steps to the side. Now aligned for the perfect kick, he glances briefly up through the goal posts before bringing his gaze back down to the squatter’s position. “I can do this,” he tells himself. As the ball is snapped, he strides forward, locking his back foot before following through with his kicking foot—a fluid two-second motion that sends the ball soaring high into the air and eventually between the goal posts. Three precious points are added to the scoreboard as the crowd cheers. And the kicker’s larger, dirtier teammates begin to pat their comrade on the back as he jogs back to the sidelines. And if that field goal kicker is truly prepared, according to Dr. Mark Anshel, a professor in the Department of Health and Human Performance at MTSU, all of this has already happened in the player’s head several times with positive outcomes before the game has even started. Anshel teaches courses in sport and exercise psychology, research methods, experimental design and motor behavior. He’s the author of Sports Psychology: From Theory to Practice, now in its fifth edition. Much of his work was spurred by a lack of available knowledge on how an athlete can best cope with stress, which caused him to create literature in an applied area and use research as the basis of application. Given the rabid nature of collegiate fan bases, there’s usually a lot riding on the leg of the football team’s placekicker. It’s not uncommon for oversized men to fight and scrap and tear each other to pieces for 59 minutes and 59 seconds only to have the diminutive kicker on the squad determine the game’s outcome. What’s running through a kicker’s mind in such an instance? Is it different for the kicker than for the rest of us in terms of thoughts and emotions? 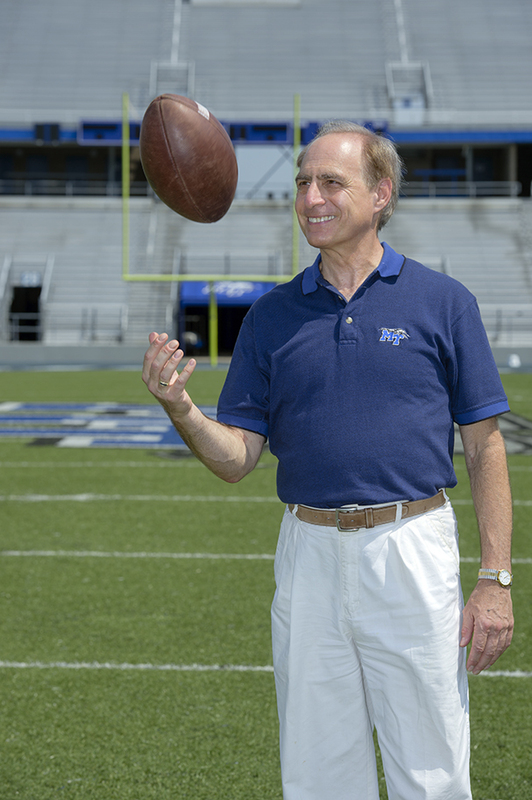 As MTSU’s resident expert on the psychology of motor performance under great anxiety or stress, Dr. Anshel is well qualified to explain the psychology of one of the most stressful sports moments—the field goal kick. According to Anshel, 70 percent of child athletes in the United States drop out of sports while in school. One primary reason, he says, is their self-perception of “low ability” in competitive athletics. Where does the negative self-view come from? Anshel says it often comes from negative feedback from coaches, parents, opponents—even teammates—which feeds self-doubt and eventually leads players to drop out, which may only add to the obesity problem in the United States. Anshel says. And that’s especially true for field goal kickers, who often dictate success or failure for their teams. Given that burden, most collegiate and professional kickers have certain personality characteristics that allow them to handle their tough job: confidence, the anticipation of success, and a strong belief in mental and physical preparation. Experience counts, too. Anshel says kickers must also keep a store of memories of positive achievement from which they can recall previous instances of success. He adds that child athletes often have issues coping with stress in sports because they’ve had little or no previous success from which to generate positive images. “These better athletes at MTSU or even these elite-level athletes have all these positive performances from their history to retrieve and recall and remember and execute mentally,” Anshel says. In addition to expecting success, accessing memories of success, and dismissing past failure as anomaly, kickers also develop a set of mental routines focused on a proper set of procedures to perform in the actual game. They mentally prepare for big moments. Do such characteristics translate into success in life? Anshel thinks so. While mental preparation is especially vital to tasks like field goal kicking, Anshel says groundwork in building confidence is the key to increasing a sense of purpose and arousal while managing anxiety in any sport—and even in everyday activity. Anshel says these coping skills can be transferred to many areas of life—he works with the Murfreesboro Police Department and emergency dispatch in order to teach them the same kind of anxiety management that a field goal kicker would use to perform a game-winning goal. “You’ve got to manage your anxiety and build confidence,” Anshel says.